For the first time ever, I've been failed by the Internet! I spent a full 30 minutes searching for a recipe for pattypan squash. Mind you, there were plenty of recipes for baby pattypan squash which are apparently de rigueur in restaurant circles. 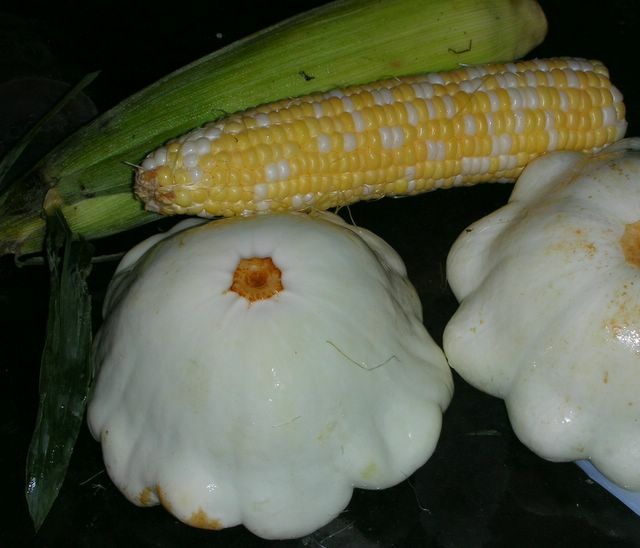 [Update: simple baby pattypan squash are quite lovely, yes!] But I learned - thank you, the Internet - that what jumped into my bag at the farmer's market on Saturday was a mature pattypan squash, one with size and heft. So I followed the suggestion of the farmer's daughter, "Just grill it." Pattypan is a summer squash - it slices easily, like zucchini and yellow squash. It tastes like a nuanced yellow squash. And grilled, it was good, left unadorned, no butter, no garlic, just the smokey essence from the grill/smoker. Place the squash on a hot grill and cook until soft. We just found a patty pan 8" across hiding in a corner of the garden. I'll try it on the grill tonight. if you have a large one I know I have steamed it whole, then scouped out the centre (retaining the shell). Diced the scouped out bits and fried it with veg and ground meat (I'm a meat eater) into kind of a chili. Then pour mixture into the squash shell. Into a 350 oven until heated through. Stuffed patty pan squash. Sorry no details but I made it up so it is all fexible. Good luck.